Geräumige 3 Schlafzimmer, 2 Badezimmer im Chalet-Stil zu Hause nur 1 Block von einem der schönsten Strände im Norden von Michigan - Empire Beach am Lake Michigan. Das Hotel liegt im malerischen, historischen Kaiserreich, ist das Haus in der Mitte der Sleeping Bear Dunes National Lakeshore, die vor kurzem wurde die Nummer 1 schönste Ort in Amerika in einer Umfrage von Good Morning America übernommen gestimmt. Das Haus ist einen halben Block vom Herzen des Dorfes entfernt, wo sich Restaurants, eine Bank, ein Postamt, Galerien und eine öffentliche Bibliothek befinden. Das Innere des Hauses verfügt über einen offenen Grundriss mit Wohnzimmer, Essbereich, Küche, Bad und Schlafzimmer mit Doppelbett auf der Hauptebene. Die zweite Ebene enthält zwei große Schlafzimmer, eines mit einem Doppelbett, und das andere mit Doppelbett und zwei Einzelbetten, und ein Vollbad. Das Haus verfügt über kostenlosen WLAN-Internetzugang. Empire befindet sich im Herzen der Sleeping Bear Dunes National Lakeshore befindet. Neben Schwimmen, Wandern und andere Outdoor-Aktivitäten enthält der Nationalpark die Sleeping Bear Dune Climb, Pierce Stocking Scenic Drive, die Manitou Insel Tauchen Preserve; Nord und Süd Manitou Inseln, und das Empire Bluffs Wanderweg. Badezimmer 1 ist im Erdgeschoss gelegen. Badezimmer 2 befindet sich auf der zweiten Etage. Neueres Haus mit offenem Grundriss. Das Haus verfügt über WLAN-Internetzugang, Waschmaschine und Trockner, und Grill. The house is a cozy, clean and inviting space. It was just right for my family of four adults. We rented this Empire house while we worked on a new house. It was great for cooking our meals cheaply and getting a good sleep on very comfortable beds. There was a large dining room table for eating and for laying out the plans and blueprint. The tv worked well and the furniture was comfortable. Usually, you run across something that you need while staying somewhere over night. Not here, every detail was accounted for! Perfect location. House was very nice and clean. Bedrooms were nice size and comfy for our group. Would definitely rent this house again. Stayed two nights with my sis and my dog. Dog fee is $100. The house is close to Empire beach and the National Park. Empire is very small and eating options are very limited in the evening. The heating was not working when we arrived (about 7 pm) but there was a small electric fan heater which did the job. Steve got the furnace fixed next morning. Since there is no official cleaning fee, house rules are that floors are brushed and vaccumed before checking out, with or without a dog. Check out is 10am. Short walk (take flashlight at night) to Lake Michigan beach(rocky and cold) and South Bar Lake(sandy and warmer). Beach has fire pits, volleyball, and parking is $1 per hour until 8PM. Sleeping Bear(Philip Hart) visitor center very close. 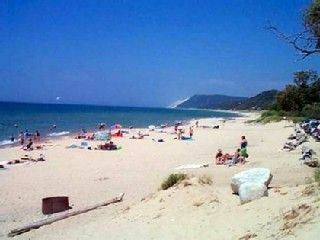 7 mile drive to Glen Arbor where there is Anderson's grocery store otherwise use EZ Mart 1 block away. Good sandwiches and custard 1 block away. We drove south to the Empire Bluff Trail 1.5 mile hike up and down hills on gravel trail with hang glider launch site at the end by the lake. We went to Platte River to rent canoes and Glen Arbor to do charter fishing then got the fish cleaned (salmon and bass) next to Empire Outdoors less than a block away. The house was very clean, washer and dryer with detergent in the 1st floor BR, Charter cable for TV, heater fireplace in LR, kitchen had detergent, pots, pans, cutting boards, dishes, everything we needed, even brownie pan. BBQ grill in back yard with picnic table. We ate a lot of Coho salmon! The home was extremely clean on check-in. The location close to Empire beach is extremely convenient. The only concern is that I would prefer to pay a cleaning fee rather than be required to vacuum and sweep on check out. That is difficult to do while packing and caring for small children. Thank you for the positive comments regarding our home. We do not charge a cleaning fee and only require that the guests do dishes and leave the home in broom clean condition. It is posted in the home that if a renter does not wish to leave it in that condition, a cleaning fee will be charged. The choice is up to the individual guest. Dorf von Empire ist am Lake Michigan in der Mitte der Sleeping Bear Dunes National Lakeshore befindet. Es ist ein Vier-Jahreszeiten-Bereich mit einer Fülle von Festivals, Kunstausstellungen und Freizeitaktivitäten. Summer season: Weekly rental only (June 2 to Sept. 1), Saturday to Saturday. $300 refundable security/damage deposit required at time of booking. Fall/Winter seasons: $150-$200 refundable security/damage deposit required at time of booking. If cancellation occurs 60+ days prior to reservation date, deposit will be refunded. Weeks with major holidays, 3 day minimum required. Bookings are secure and guaranteed. Check in is on or after 4 pm on the day of arrival. Check out is on or before 10 am on the day of departure.